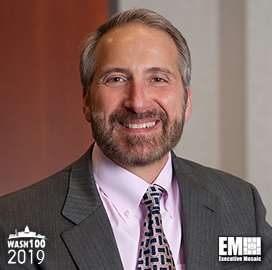 Executive Mosaic is honored to introduce Jason Providakes, president and CEO of Mitre, as an inductee into the 2019 Wash100 — Executive Mosaic’s annual selection of the most influential voices in the government contracting arena — for leading Mitre and securing major contracts for the company. This latest honor marks the second consecutive Wash100 Award for Providakes. Providakes has served as president and CEO of Mitre since March 2017. He is a former senior vice president and general manager of the Mitre Center for Connected Government, now known as the company’s public sector arm. Since joining Mitre in 1991, Providakes has led federal infrastructure modernization efforts and held senior leadership roles where he supported technological transformation initiatives for the military. He supervises the company’s operation of federally funded research and development centers sponsored by the U.S. government. The centers address issues in cybersecurity, healthcare, judiciary, aviation, homeland security, civil systems, defense and intelligence. In September 2018, Mitre secured two contracts to provide operational support to two crucial centers. The first $406.8M contract required Mitre to support the U.S. Air Force through the National Security Engineering Center through September 2019. The second is a potential $1.5B recompete contract to continue managing a healthcare center for the Centers for Medicare and Medicaid Services through 2023. According to Providakes, Mitre aims to collaborate with the private sector on enterprise modernization, data analytics, cybersecurity and health policy-related initiatives to help CMS. Providakes has participated in studies by the National Academy of the Sciences and served on the Army Science Board. He utilized his knowledge in optical and remote sensing technology in teaching, performing research and publishing academic works on the phenomenon of radar backscatter that occurs in the Earth’s ionosphere. He holds a doctorate degree from Cornell University and bachelor's and master’s degrees in electrical engineering from the Worcester Polytechnic Institute. Worcester partnered with Mitre for a fifth-year master’s degree program to enable graduate students to work at the company while completing their degrees. Executive Mosaic congratulates Jason Providakes and the Mitre team for their selection to receive this award.